Thank you for indicating your interest in our expanding line of history and geography products! 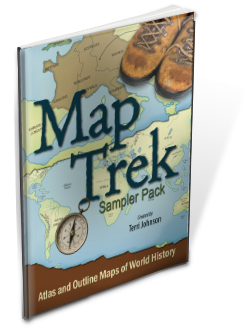 As part of our Map Trek promotion, we are pleased to give you this very large sampler pack of maps from all four Map Trek ebooks - retail value $12.95. We hope that you use these with your students and enjoy your learning moments together. 47 pages.